Today, PPIC and UC Davis released a new report on the economy of the Sacramento-San Joaquin Delta. “Transitions for the Delta Economy” explores how the Delta’s economy has evolved since the early 1990s and how it may continue to change over the coming decades as a result of island flooding, habitat restoration, and changes in water quality from sea level rise and a possible new conveyance facility for water exports. The analysis relies on a range of field data and models of the region’s economy, agricultural production, and water flows and quality. The conclusions should be thought-provoking for local governments and those involved in various water policy processes focusing on the Delta. This blog entry summarizes the report. The Sacramento-San Joaquin Delta consists of some 737,000 acres of low-lying lands and channels at the confluence of the Sacramento and San Joaquin Rivers. This region lies at the very heart of California’s water policy debates, transporting vast flows of water from northern and eastern California to farming and population centers in the western and southern parts of the state. This critical water supply system is threatened by the likelihood that a large earthquake or other natural disaster could inflict catastrophic damage on its fragile levees, sending salt water toward the pumps at its southern edge. In another area of concern, water exports are currently under restriction while regulators and the courts seek to improve conditions for imperiled native fish. Leading policy proposals to address these issues include improvements in land and water management to benefit native species, and the development of a “dual conveyance” system for water exports, in which a new seismically resistant canal or tunnel would convey a portion of water supplies under or around the Delta instead of through the Delta’s channels. This focus on the Delta has caused considerable concern within the Delta itself, where residents and local governments have worried that changes in water supply and environmental management could harm the region’s economy and residents. In 2009, the state laid out a new policy framework and governance structure for the Delta. The Delta Reform Act (Senate Bill X7-1) declared it a state priority to address two “co-equal goals”—improving water supply reliability and protecting and enhancing the Delta ecosystem—while also protecting and enhancing the “unique cultural, recreational, natural resource, and agricultural values of the Delta as an evolving place “ (Water Code § 85054). The Delta will indeed be evolving, as a result of both reform efforts seeking to address these co-equal goals and also irreversible natural forces (earthquakes, flood flows, sea level rise, climate warming) that threaten the stability of Delta levees and alter water quality. Our new study, Transitions for the Delta Economy, examines the potential economic effects of changes in the Delta land and waterscape resulting from management activities and natural forces and suggests planning priorities to support economic transitions in the region. We review recent patterns and trends in Delta land use and employment, and draw on a range of data and modeling tools to assess the effects of several types of physical changes on economic activity in the Delta: (i) the permanent flooding of roughly 75,000 acres of land on subsided Delta islands that may not offer sufficient economic justification for repair after flooding; (ii) increases in irrigation water salinity from the introduction of dual conveyance, sea level rise, and the flooding of islands that restrict salinity intrusion from the Delta’s western edge; and (iii) reductions in cropland from the expansion of seasonal floodplain and tidal marsh habitat. Most of these changes will directly affect land and water conditions in the Delta’s primary zone—nearly 500,000 acres of largely subsided agricultural lands in the inner Delta, where development is restricted because of high flood risk. 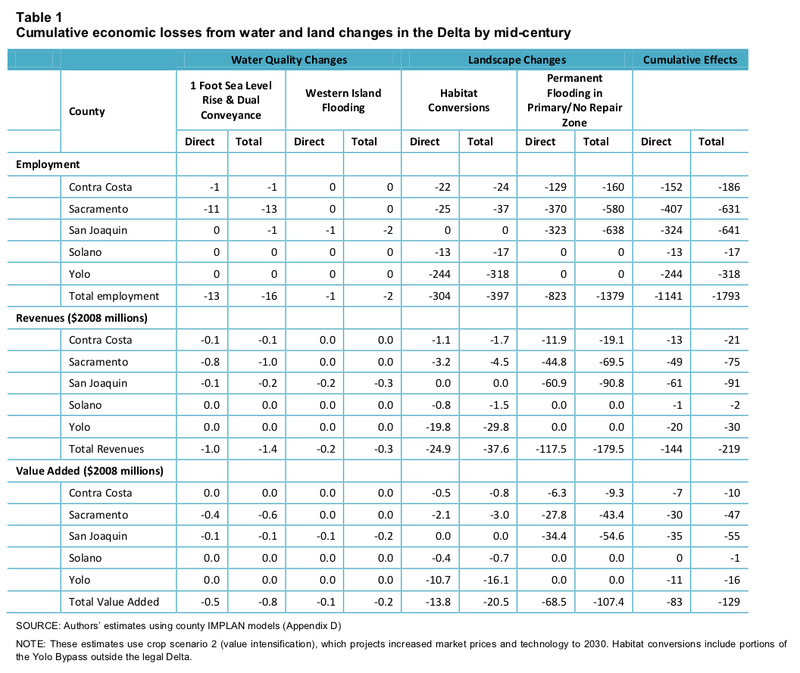 Within the first half of this century, island flooding, habitat conversions, the introduction of dual conveyance, and sea level rise could generate over 1,100 direct job losses per year within this zone and annual reductions of over $80 million in value added—a measure of overall economic activity (Table 1). Total losses for the wider region—including multiplier effects—may reach 1,800 jobs per year, $130 million in value added, and nearly $25 million in state and local tax receipts. For the primary zone, the direct losses could be significant—roughly 15 percent of primary zone economic activity. However, for the legal Delta as a whole, total losses would amount to just 1 percent of economic activity, and likely even less, as the region’s overall economy continues to grow disproportionally outside of the Delta’s primary zone in the coming decades. 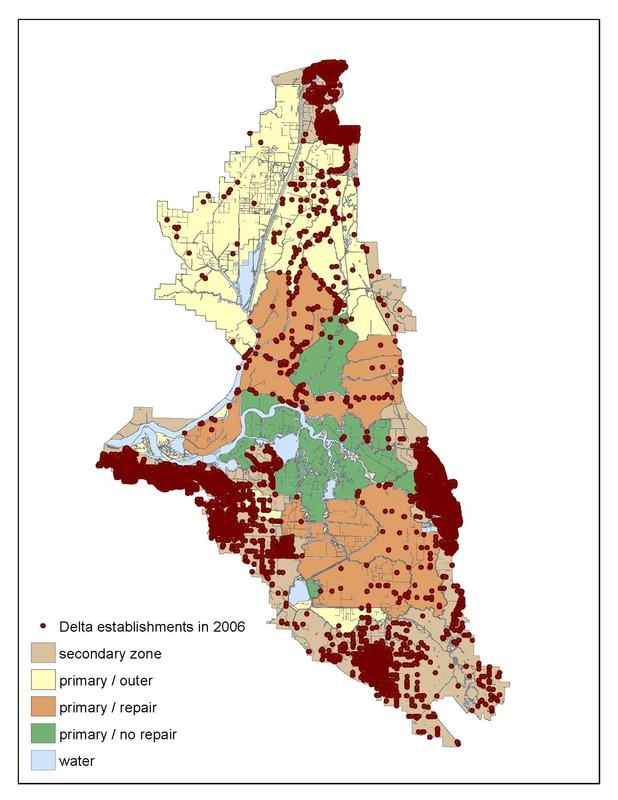 This wide difference in effects across the Delta will occur because most Delta residents (98%) and most businesses and jobs (96%) are located in the Delta’s fast-growing secondary zone, where restrictions on development are less severe (Figure 1). (Between 1990 and 2010, the Delta’s population grew from roughly 320,000 to 577,000 residents, and almost all of this growth was in the secondary zone). Rather than trying to prevent the Delta’s landscape from changing, planning efforts should anticipate and prepare for the likely changes to the region’s land and water resources. Many changes—including earthquakes, sea level rise, and higher flood flows—are inevitable, and management decisions will need to assess how best to respond in ways that use scarce dollars to protect human and environmental uses of the Delta’s land and water resources. The report identifies four planning priorities. Flood policy. The first is to make strategic decisions on where to invest in Delta levees to protect the most valuable lands. State and federal subsidies for Delta levees are unlikely to be sufficient to protect all of the Delta lands from flooding or to restore all flooded islands; some areas should have higher priority because of their larger populations and significant economic assets. Recreation sector. The second priority is to encourage growth within the inner Delta of nature-based and cultural recreation, a sector that can help offset some of the losses from reduced agricultural production while capitalizing on the population growth in the surrounding region. Hydrodynamic modeling. A third imperative is to conduct more extensive and detailed modeling of the effects of natural forces and management changes on water salinity within the Delta. Using the most technically-grounded results on this question to date, we find that these effects may be much smaller than many Delta residents have feared. However, further work is needed to understand the potential effects of operational changes in the water system under changing natural conditions. Mitigation policy. Finally, mitigation actions are needed to soften the costs of adjustment for landowners and others harmed by physical changes in the Delta. In the case of landowners, it is already standard practice to compensate for conversions of land to habitat, either through conservation easements or outright purchase. Similar policies may be in order for islands that are likely to permanently flood, whether or not there is a legal requirement to do so. Because removal of some lands from production can reduce local tax receipts and affect local labor and other businesses, some mitigation funds may also be appropriate for community use. Similar funds now exist in southern California irrigation districts that are fallowing land in order to sell water to urban areas. Lund, J., E. Hanak, W. Fleenor, W. Bennett, R. Howitt, J. Mount, and P. Moyle (2010), Comparing Futures for the Sacramento-San Joaquin Delta, University of California Press, Berkeley, CA. Lund, J. (2011), “Sea level rise and Delta subsidence—the demise of subsided Delta islands,” http://CaliforniaWaterBlog.com, posted March 9, 2011. Lund, J. (2011), The Delta, in 3-D, http://CaliforniaWaterBlog.com, posted May 19, 2011. Lund, J. 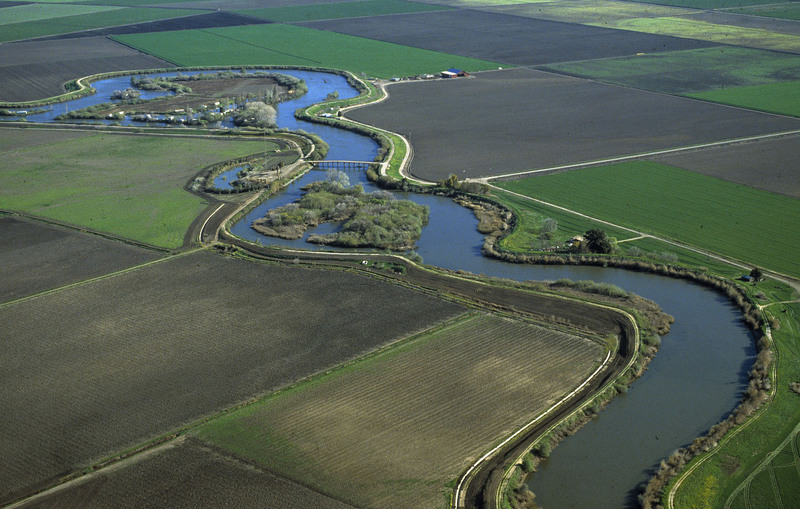 (2011), “Israel’s Delta – The Hula Valley,” http://CaliforniaWaterBlog.com, posted December 14, 2011. Suddeth, R., J. Mount, and J. Lund (2010), “Levee Decisions and Sustainability for the Sacramento–San Joaquin Delta.” San Francisco Estuary and Watershed Science 8 (1). This entry was posted in California Water, Economy, Planning and Management, Sacramento-San Joaquin Delta and tagged Delta, Delta islands, economics, Jay Lund, subsidence, UC Davis Center for Watershed Sciences, water management, water planning. Bookmark the permalink.